If you are looking for some affordable Android tablet then you need to wait till 19 November when Sistem will launch three Tablets named as Energy Tablet i828 HD, Energy Tablet i824 and Energy Tablet i724. Among Trio, Energy tablet i724 comes with lowest price €134,75 while prices of i824 and i828 are €194,07 and €168,64. Now I’m going to highlight the specs of each Android tablet for you. 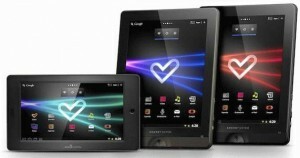 Energy Tablet i828 HD: It is a high-end tablet which will run on Android 2.3 Gingerbread operating system. Great honeycomb style experience is made possible with the mean of high performance and flash support. As the name describes, this Android tablet is featured with capacitive 5 points multi-touch High Definition screen TFT LCD 8 “4:3 with last generation technology. That’s mean you are able to enjoy high quality videos and picture on the display. This tablet’s screen will offer you a home theatre experience at an affordable cost. You will be able to get connected with the mean of a Wi-Fi access point. There are dual cameras for your fun and entertainment; one is rear and second is front facing snapper. There is an HDMI port which allows you to watch 1080p video on the big screen. Energy Tablet i824: It is another Gingerbread powered tablet which is featured with an 8 inch capacitive 5 points multi-touch screen TFT LCD however this screen is not High Definition. Although you will get the good quality of picture yet you will enjoy more with the display of i828 HD Tablet. It also comes with Wi-Fi and HDMI. However, there is only front facing camera. Energy Tablet i724: This is the cheapest than other two Android Tablet, the reason is its small screen. It is featured with a 7 inch capacitive multi-touch screen TFT LCD display having 16:9 aspect ratio. Other features are similar to i824 i.e. Wi-Fi , front facing camera, Android 2.3 OS and HDMI. Would you like to buy Energy Tablets on 19 November?